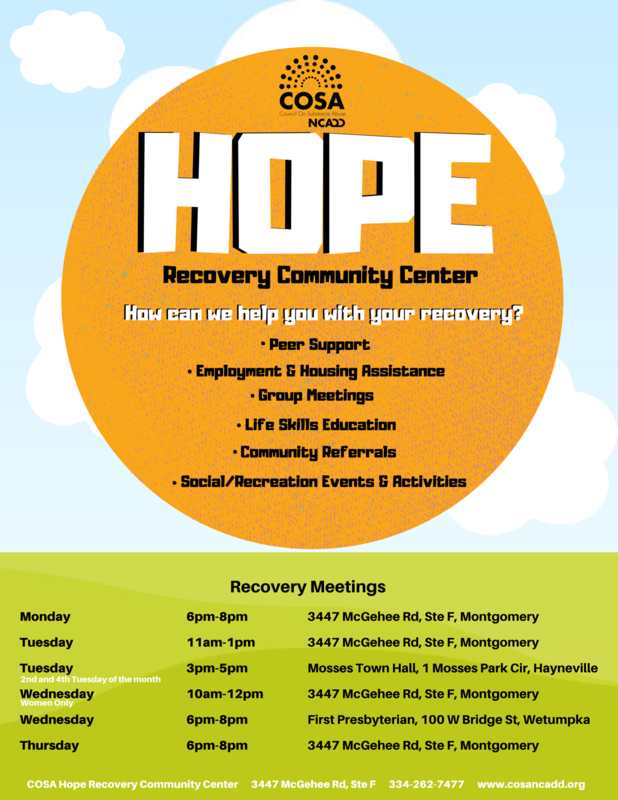 The Recovering in Rural Communities Project (RRC) uses evidence-based peer-to-peer recovery support services to prevent relapse and promote sustained recovery among 400 persons with substance use disorders living in rural River Region Counties (Montgomery County, Autauga, Elmore & Lowndes Counties) of Alabama. RRC programming will respond to the needs of residents in rural communities who have limited or no access to recovery programs and services. The Council on Substance Abuse-NCADD (COSA-NCADD) has implemented programs to provide: (1) Peer-Facilitated Recovery Support Meetings/Groups; (2) Recovery Coaching and Mentoring; (3) Peer Case Advocacy, Information and Referral; (4) Life Skills: (5) Leadership Skills Development and (6) Social/Recreational Opportunities.